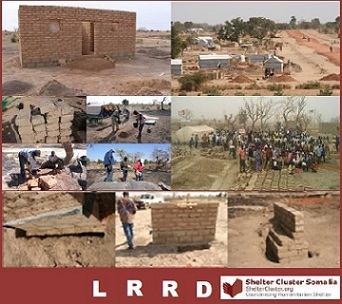 Sustainable shelter solutions are a strategic focus of the SC. While emergency assistance remains a key activity of SC partners, the SC strives for sustainable shelter solutions throughout its transitional and permanent shelter pillars. The Cluster is transitioning away from care and maintenance and moving towards durable solutions, particularly in contexts in which permanent shelter solutions are considered attainable. However, the needs to accomplish durable solutions in rural and urban settings vary widely and the Somalia context is challenging for long-term programming. It would be impossible in the near-term to accomplish all the criteria required to achieve durable solutions for the displaced populations in Somalia. This is mainly due to problems related to land tenure, IDP legal rights status, and low humanitarian funding levels. The SC, therefore, focuses on sustainable shelter solutions to ensure that communities are more resilient to future shocks. Sustainable shelter approaches need to be addressed as a holistic package and need a strong integrated approach with all other sectors (e.g., water, sanitation, and hygiene (WASH, education, health). The following concepts are key to the sustainable shelter solution approach and will be outlined below: (1) security of land tenure, (2) livelihoods strategy, (3) spatial integration of the settlement and integration of infrastructure services, and (4) culturally adapted shelter and settlement design, including protection concerns.